The LISA mission was planned to be the first space-based mission to attempt the detection of gravitational waves. These are ripples in spacetime that are emitted by exotic objects such as black holes. An ambitious mission to seek out gravity waves by launching a joint U.S.-European observatory into space in 2015 is now officially off the books, NASA and the European Space Agency say. The project, called the Laser Interferometer Space Antenna, or LISA, was slated to search for ripples in space-time predicted by Einstein's theory of general relativity. These gravity waves have never been directly observed by astronomers. The partnership between the European Space Agency and NASA on the project was called off because the cash-strapped U.S. space agency would have been unable to contribute the funding required for the mission. Now ESA plans to go it alone, though it's possible NASA may still be able to play at least a minor role in the project. 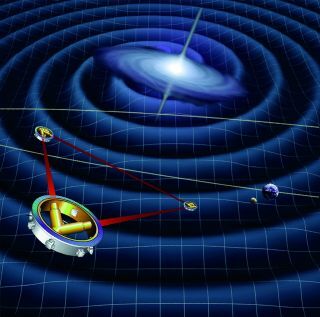 "ESA has invited NASA to nominate one member to the science team for the ESA-led gravity wave observatory now being formulated," said NASA spokesman Trent Perrotto. "We will remain engaged in the process and look forward to an opportunity to participate in the ESA effort." While ESA still hopes to build a gravity wave detection system in space to complement one located in Louisiana, it won't have the scale of LISA, an ambitious project that would have launched three identical triplet spacecraft to fly in a triangle formation. While the existence of gravitational waves has been implied by astrophysical observations, none has been directly detected. "The amount of science likely to be accomplished by either agency alone will certainly be less than LISA," Stebbins said. Yet it is too soon to give up all hope. "After 25 years at hard labor, I'm still convinced that a gravitational wave mission will happen. There are hundreds of other researchers with similar strong convictions." Under the new federal spending plan passed by Congress April 14, NASA will receive $18.5 billion for the rest of 2011 – a budget some $240 million below last year's level. Meanwhile, some big-ticket items are eating up huge chunks of the agency's budget. The James Webb Space Telescope, envisioned as a successor to Hubble, has experienced major cost overruns and schedule delays. The recently released astrophysics Decadal Survey, an independent review of what goals NASA should target in the next 10 years, prioritized other missions ahead of LISA. "It has been understood for a long time that only one of several major mission concepts could move forward in the coming decade," Perrotto told SPACE.com. The Decadal Survey ranked the Wide-Field Infrared Survey Telescope (WFIRST) – a planned observatory to study alien planets and dark energy – ahead of the LISA mission, he said. While there has never been a space-based gravitational-wave detector, a ground-based experiment called LIGO (Laser Interferometer Gravitational-Wave Observatory) is a joint project between scientists at MIT, Caltech and other institutions to search for evidence of gravity ripples in space-time. The detector, funded by the National Science Foundation and located in Livingston, La., uses miles-long L-shaped vacuum chambers to detect the slight compression along one side that would be caused by an incoming gravity wave. LIGO has been operating since 2002 and has teamed up with other detectors, including the French-Italian VIRGO detector. "LIGO-Virgo, the worldwide ground-based network, possibly in conjunction with Japan, are likely to make the first direct detection of gravitational waves in five to seven years," Stebbins said. Such a breakthrough wouldn't diminish the need for a space-based detector like LISA, she said. In fact, it might provide the push the project needs. "One might expect the physics and astrophysics communities to be energized by that triumph and to press for a space-based detector," Stebbins said. "The gravitational-wave 'sweet spot' of the universe is in the LISA band, several decades of frequency below the reach of the ground-based detectors. The greatest number and the strongest sources are in that low-frequency band. Anyone with a curiosity will want to know what the universe looks like in the last spectrum to be explored by humanity."